San Marcos, one of the largest late prehistoric Pueblo settlements along the Rio Grande, was a significant social, political, and economic hub both before Spanish colonization and through the Pueblo Revolt of 1680. 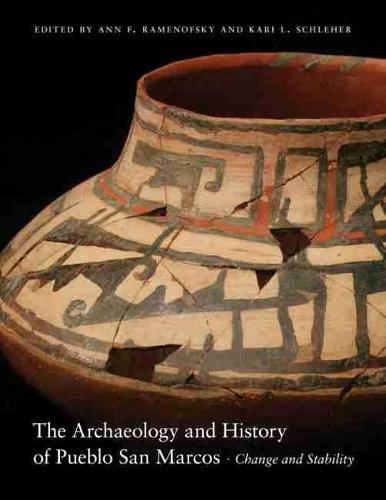 This volume provides the definitive record of a decade of archaeological investigations at San Marcos, ancestral home to Kewa (formerly Santa Domingo) and Cochiti descendants. The contributors address archaeological and historical background, artifact analysis, and population history. They explore possible changes in Pueblo social organization, examine population changes during the occupation, and delineate aspects of Pueblo/Spanish interaction that occur with Spaniards' intrusion into the colony and especially the Galisteo Basin. Highlights include historical context, in-depth consideration of archaeological field and laboratory methods, compositional and stylistic analyses of the famed glaze-paint ceramics, analysis of flaked stone that includes obsidian hydration dating, and discussion of the beginnings of colonial metallurgy and protohistoric Pueblo population change. "Encyclopedic in detail, this treasure trove provides theoretical historiographies, carefully defined hypotheses, clear methodologies, and well-defined maps, charts, and tables on virtually any subfield of Southwestern archaeology as found at San Marcos. . . . This reference work is an excellent resource for any scholar, professional, or ardent enthusiast of these subjects."